Ok ladies an gents I have officially given up the Ombré for the summer and switched it up a bit! 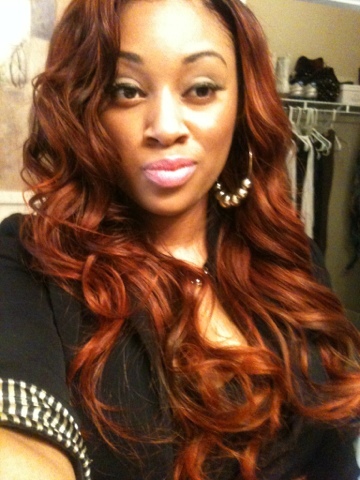 I am now a RED head!!!... I am loving it!!! The "Virgin Brazilian Hair" has really made its mark with me! I will NEVER wear anything else!!!! I currently have in a 28", 26", 22", and a 18"!!! The longer the hai the more bundles needed for a full install! I lifted the hai previously with bleach and developer. I did this a few times while playing with the Ombré technique always trying to keep it current. Then I decided to do a full color change. I lifted ALL of the hair from a level 2-3 to a level 7-8... This must be done poor to applying a color lighter than the natural state... A color will NOT lift a color! Once the hair was lifted I shampooed ONCE without conditioning because I knew I wanted to apply my color... Because I just lifted the hair using a 30 volume developer I am aware the "cuticle" meaning outermost layer of the hair is now open which will allow for my color deposit to penetrate easier. 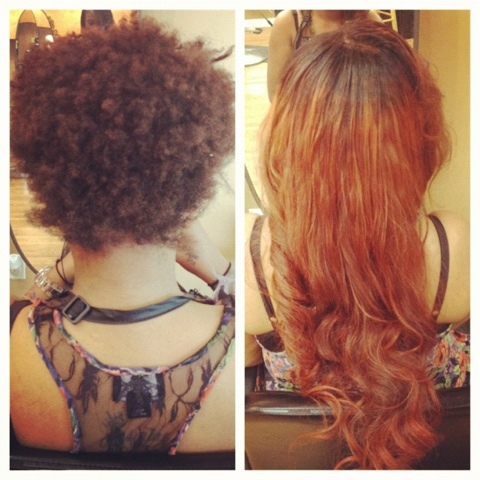 Knowing this will happen once I lift the hair it plays a major role in choosing my product to color with. It is Virgin Hair and CAN be over processed so with this in mind I chose a semi permanent color by a company called Adore! I love there color selections! This color does NOT require developer which I like because it is NOT as haram to the hair and gives you more time to apply completely making sure its NOT patchy. I chose Orange Red and I mixed it with Copper Brown because I knew I wanted a darker dimension! 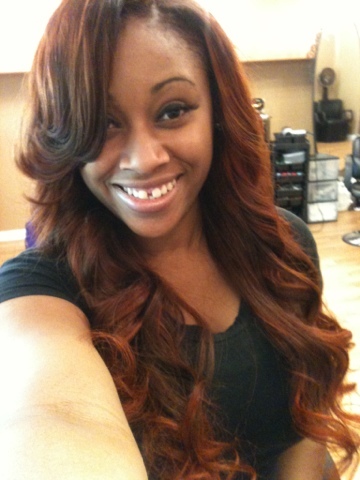 Play with the color selections ladies this customizes your look. It's just like paint you can chose a color and mix it with a color to contrast that can either brighter the color or tone it down! I deposited the color all over the hair and let it sit for about 45 mins periodically running the color through to ensure an even distribution! I LOVE LOVE LOVE my results! 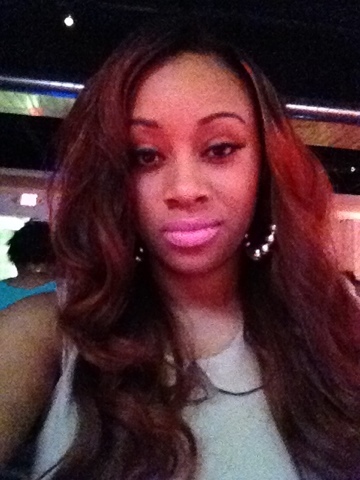 Color is fun ladies and with this Virgin Hair it's allows us to play with color without having I color OUR own hair!!! Take advantage!!! Cute little Movie Date outfit!